Behavioural training programmes using after-action review (AAR) can inform valuable feedback and embed new, enhanced skills. AAR training provides delegates with both knowledge of and confidence in using the AAR tool and insights into personnal and team behaviours. AAR is a highly effective learning tool which is used to overcome traditional barriers to good communication and enable clinical and non clinical teams to improve on performance and quality. AAR Foundation provides an excellent introduction to AAR and focuses on healthy team behaviours. AAR Conductor builds from AAR Expect to enable delegates to improve their skills in using the tool and explore their own reponse to difficult situations. AAR Masterclass is suited for those who support others learning and run AARs regulary. 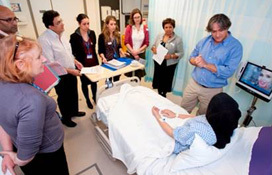 All the courses are available to UCLH, external NHS and non NHS staff alike. Suitable only for those who have attended AAR Expect or have significant other facilitation experience and training. The NHS Staff College leadership development programme is grounded in practical, proven methodologies delivered by a tried and tested faculty of established leaders drawn from the NHS and the Armed Forces and Business and Education. Download the Staff College flyer. Introducing new processes to teams is most effective when they are able to participate and plan for the change. 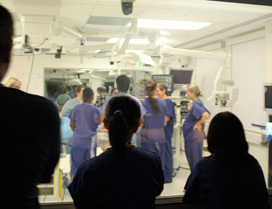 Using simulation techniques UCLH engaged over 70 full multi professional theatre teams in preparing for the national introduction of the WHO Safe Surgery Checklist and the results in terms of reduced incidents, increased staff engagement and improved communication are impressive. This highly successful programme is now available to teams from other hospitals both on the UCLH site and locally. Run as a half day session, discrete surgical teams explore together as a multi professional group how the checklist can work effectively for them. Presentations and facilitated discussions ensure real issues which could become blockers are uncovered. The focus is not on the technical ability of staff to comply with the simple checks asked of them but more on the reasons these checks may be missed. The programme looks at team working, communication, leadership, hierarchy and ultimately looks to create the right environment in which every voice is heard. The programme follows the NPSA 5 steps to safer surgery recommendations and introduces briefing and debriefing into the theatre team. This is an experiential course that looks at team behaviours through peer review and expert facilitation. 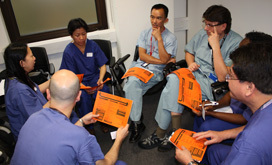 The introduction of the WHO Safe Surgery Checklist (SSC) at UCLH demonstrated how a simple tool, properly implemented, could significantly improve patient safety, teamwork and staff morale in theatre. How could those benefits be brought to bear on safety issues in a wider clinical context? As an answer to that question we have developed a Ward Safety Checklist that can be used during inpatient rounds and shift handovers - two near-universal elements of inpatient care that are known to be common sources of safety and communication failures. The checklist prompts clinical teams to consider basic issues of care which, though familiar, are routinely missed or forgotten, causing harm and distress to patients. Like the SSC, the Ward Safety Checklist is introduced to staff through a half-day programme of discussion, multimedia presentations and filmed simulations. The programme illustrates how checklists are simply an acknowledgement of the fallibility of human memory and decision making in a complex, changing environment. Their effectiveness lies not so much in the contents of the list as in the attitudes and behaviours that are brought to their use. Through the programme, teams come to understand checklists not as a challenge to their competence or individual talent, but as a demonstration of collective humility in a quality-critical environment and as a declaration of their ambition to provide standardised, safe, high-quality care. For information on the behavioural programmes, or to submit a request for bespoke training, contact us.